Your kids will love making this Candy Cane Slime to play with over the holidays! This easy recipe uses no borax, but includes glue and shaving cream. It smells like candy canes too, because of the peppermint extract inside. It’s a great Christmas craft for kids to make and share with their friends! This is also a fun activity for the kids to do when it’s too cold or rainy to go outside to play. And they don’t have to stick with red and white slime…they can mix it up and try different colors throughout the rest of the year. Maybe challenge them to come up with themed slimes for other holidays! 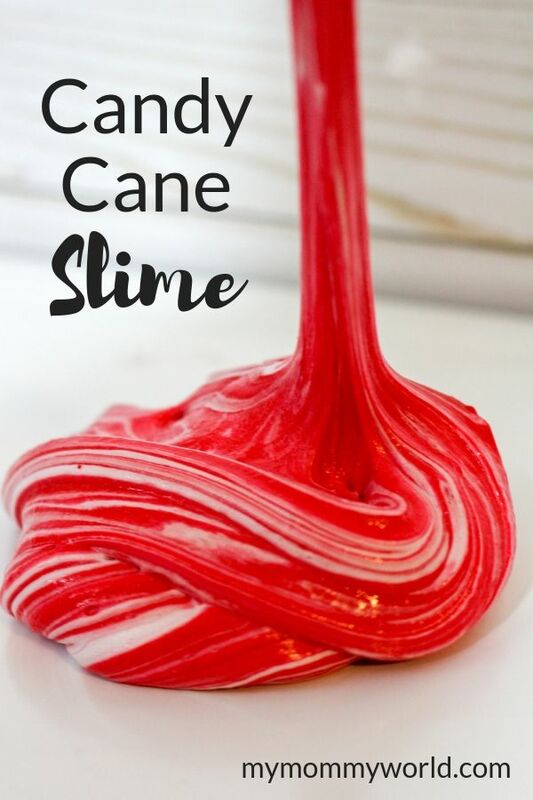 You may already have most, if not all, of the ingredients in your pantry, craft closet, or bathroom cabinet to make this fun candy cane slime. Please note, this post contains referral links, which means that I earn a small commission when you make a purchase through that link. 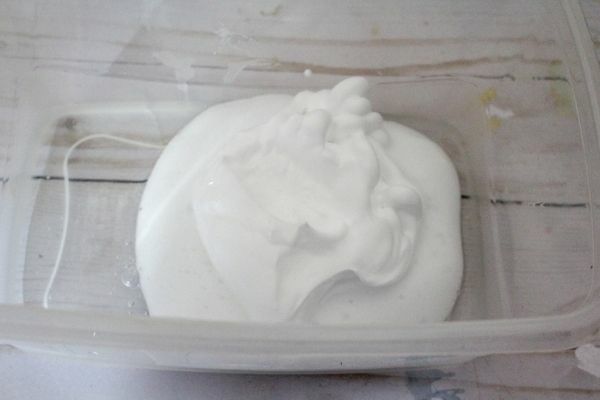 This slime is made in two stages…one for the white color and one for the red color. At the end, you’ll twist the two slimes together to make the stripy colors of a candy cane! To begin, measure out 1 cup white glue and add to a bowl, along with 1 cup of shaving cream. 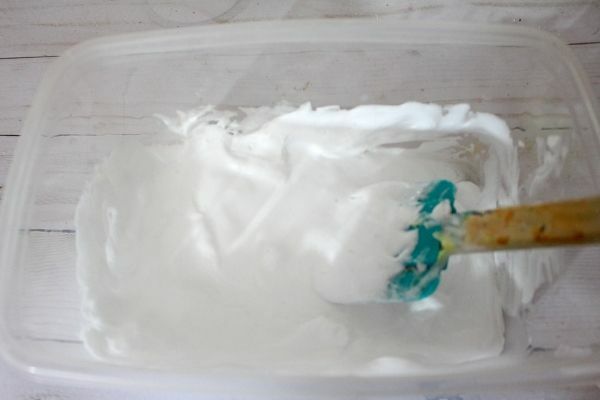 Mix the glue and shaving cream together, then add 1 cup of foaming hand wash and mix well. Your slime should be super foamy. Add in 1 teaspoon of cornstarch and about 1 teaspoon of body lotion. These will help your slime stretch and be fluffy. Next, add in a bit of peppermint extract or candy cane essential oil and stir. Finally, add in contact saline solution. Start with 1 tablespoon, but if you need to add a bit more, you can. Saline solution makes the slime less sticky. You will know you have enough when the slime pulls away from the side of the bowl. Knead the slime a bit until you get the texture you like. Repeat the process to make the red slime, except this time, use clear glue. After step 4, add red paint. Paint is the best way to get a true red color! After kneading the red slime, put it next to the white slime and wrap them around each other to make the stripes of a candy cane! Your kids will love making this Candy Cane Slime to play with over the holidays! This easy recipe uses no borax, but includes glue and shaving cream. It smells like candy canes too, because of the peppermint extract inside. A great Christmas craft for kids to make and share with their friends! In a bowl, measure out 1 cup white glue. Mix together and add 1 cup of foaming hand wash. Mix well. Your slime should be super foamy. Add in 1 tsp of cornstarch and about 1 tsp of body lotion. These will help your slime stretch and be fluffy. Add in a bit of peppermint extract or candy cane essential oil. Stir. Finally, add in contact saline solution. Start with 1 tbsp. If you need to add a bit more, you can. Saline solution makes the slime less sticky. You will know you have enough when the slime pulls away from the side of the bowl. Repeat the process, except this time, use clear glue and after step 4, add red paint. Paint is the best way to get a true red color! Want more Christmas Crafts for Kids? these fun Cinnamon Applesauce Ornaments that are great to give as gifts too! Such a fun project, I know my kids would love to make this.